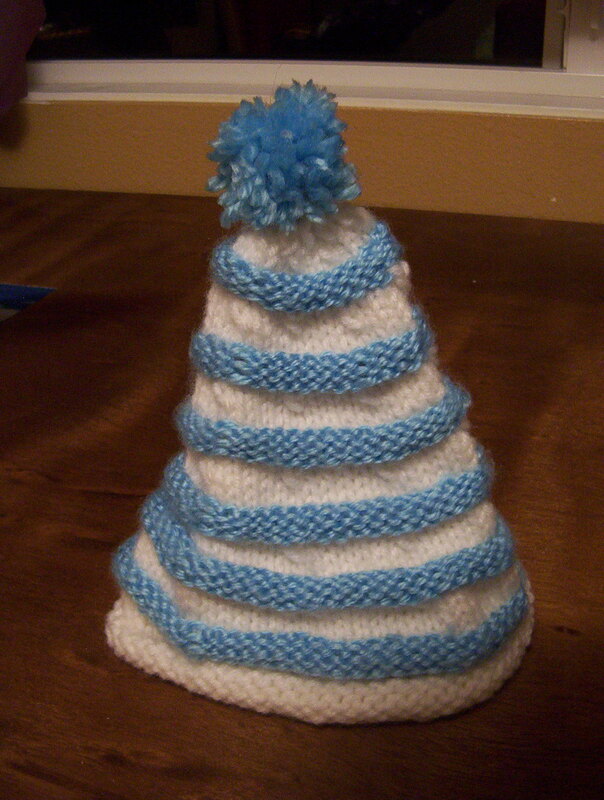 Impromptu Silly Baby Hat is done. So is all of my obligation knitting. In celebration, I am devoting the rest of the year to little, fun projects that will use up my tiny stash (gotta make room for any yarn Santa might bring wink wink). Fun fun fun. Grandpa’s socks. 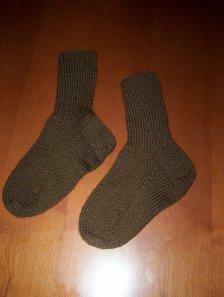 Ribbed Cuff, flap heel, lion wool in basic, manly brown. He will love them. I am so happy to make him something he will love, but I will say it again, I HATE KNITTING SOCKS!!!!!!!!!! post about the NaKniSweMo Drops Cardigan. I guess if I am going to knit a sweater in a month I wont have time to blog about it, sheesh. It’s a wonderful, quick, flattering pattern. 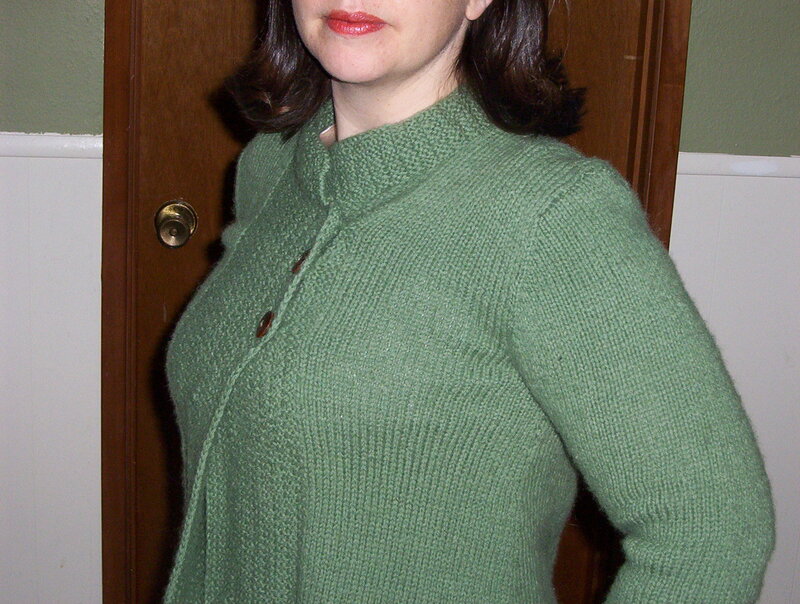 I ripped apart a vintage handknit wool cardigan that I bought for $1 at St Vinnie’s when I was pregnant. Although it was beautiful… it was huge on my post baby body. 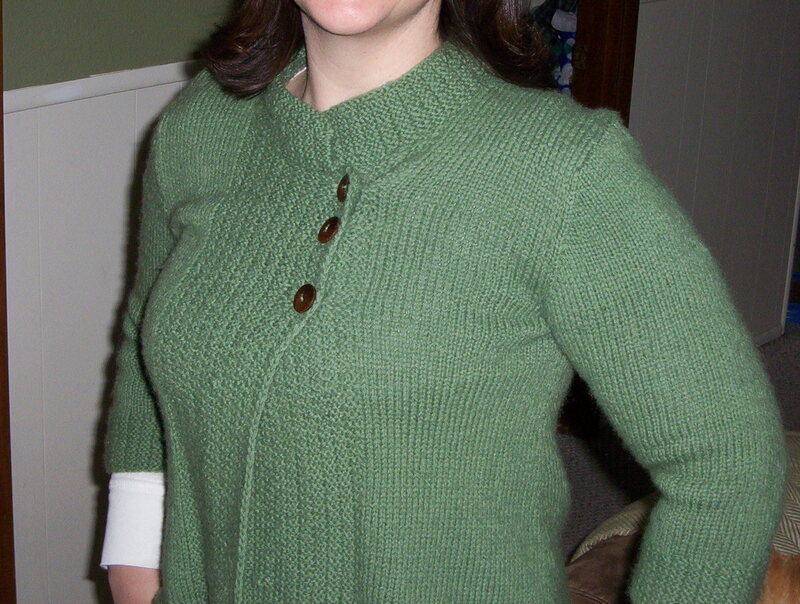 I used the worsted weight pattern but fudged the gauge a little… it fits perfectly! I knew I would be doing some finishing work on it in the car on the way to my mom’s for Thanksgiving (knitting the collar as it turns out). So I washed each piece in dish soap and blocked as soon as it was finished. I was a little overzealous with that and the a-line was quite… err… pointy. Nothing a little Eucalan couldn’t fix. After a nice bath the wool (which hadn’t been washed like that in who knows how long) blossomed and ooh la la what a purty sweater! Hmmm, didn’t quite capture the a-line for you… will take more pics today. Can’t guarantee when I’ll post them though! it’s dark and cozy at the laptop in the kitchen. The perfect time for a confession. I know this will not be a popular sentiment, but then no one reads this blog anyway. (but I’ll do it for my 92 year old Grandpa’s Christmas gift). You are currently browsing the Bunny Slippers blog archives for December, 2007.